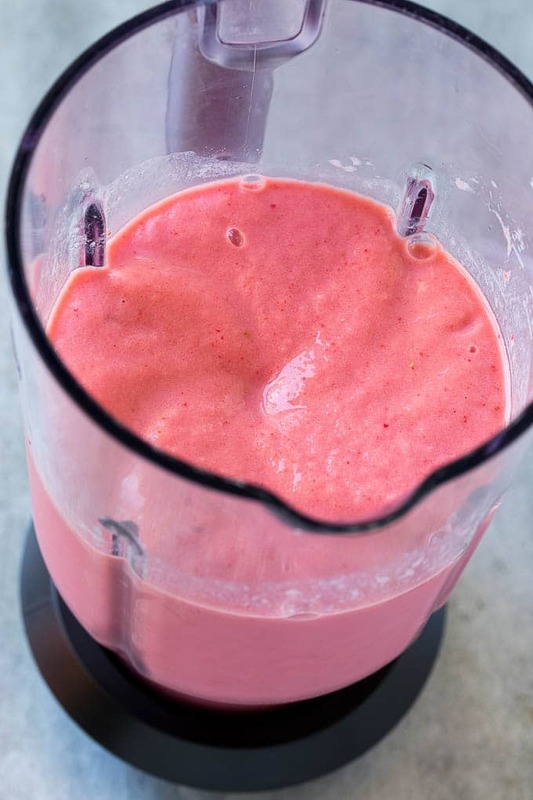 This strawberry banana smoothie is made with juice, frozen strawberries, banana and Greek yogurt, all blended together until smooth and creamy. An easy and kid friendly drink that makes a perfect breakfast or snack. Whenever we go to Jamba Juice, my kids order the Strawberries Wild smoothie. This is my copycat version that’s simple to make and will same you a lot of money by skipping the smoothie shop. Making a deliciously flavored smoothie is one of my favorite ways to fend off the heat during a hot summer day. I whipped up this strawberry banana smoothie and fell in love with it so I just had to share it. Strawberries are the perfect summer fruit and they pair well with the flavor of bananas. 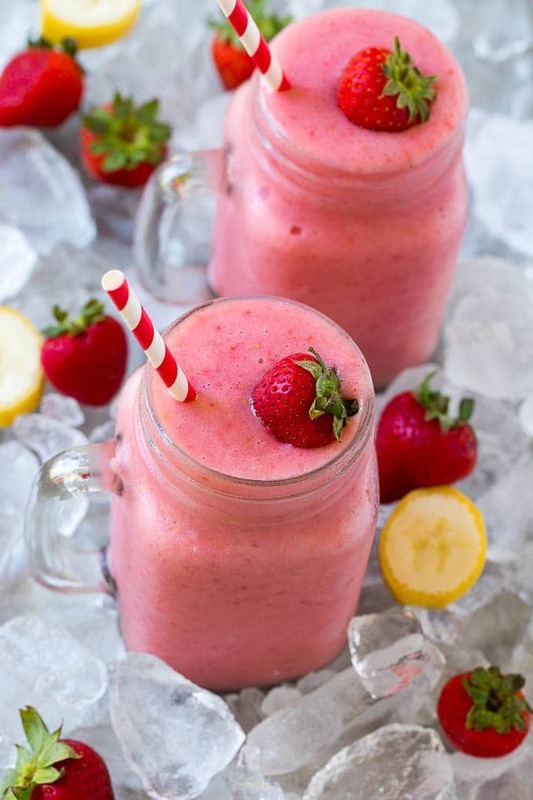 This smoothie is made with a mixture of strawberries, bananas, Greek yogurt, and juice. Once you have gathered your ingredients and measured them out, toss them into the blender. Blend the ingredients until they are smooth and creamy. Serve immediately and enjoy your summer day! This recipe calls for frozen strawberries. You can freeze your own but it’s often easier to just buy them already frozen. However, beware because some frozen strawberries come with added sugar so be sure to check the ingredient list before purchasing. You can turn this strawberry banana smoothie with yogurt into a shake if you so desire. Simply substitute the juice for milk and the yogurt for strawberry ice cream. Your healthy little smoothie is quickly turned into a sweet treat. Both are great for beating the summer heat. If you didn’t know it already, strawberries are a cholesterol free, fat free, sodium free, low calorie fruit. Strawberries also contain a lot of fiber, vitamin C, vitamin K, and a ton of other vitamins and minerals. Strawberries are loaded with potassium so if you ever get a leg cramp, try eating some strawberries! Bananas are a great after workout snack due to the high amount of magnesium they contain. They help to build the lean muscle you’re trying to accomplish by working out. Bananas also contain plenty of vitamins. I sometimes like to mix up my strawberry banana smoothie by adding an extra boost of nutrition. A few things I use are protein powder, flax seed, chia seeds, greens, or more berries such as raspberries. No matter how you customize it, you’ll love this smoothie. I know I sure did! 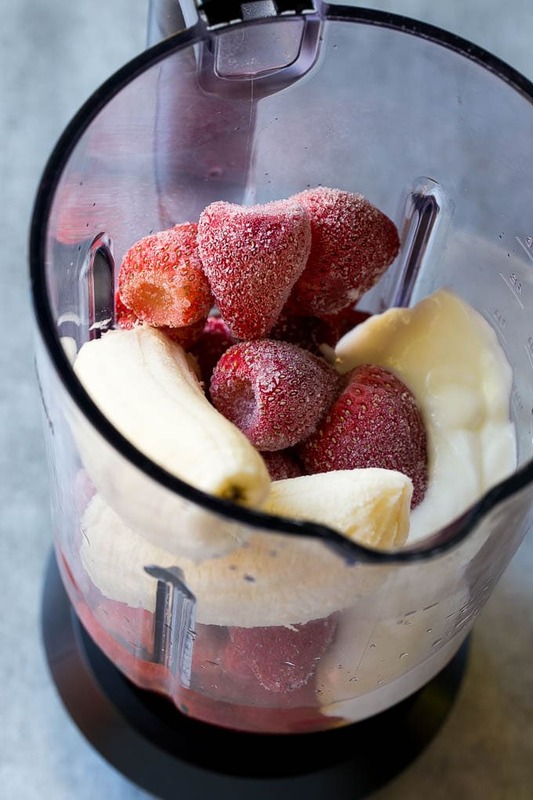 Place the apple juice, bananas, frozen strawberries and vanilla Greek yogurt in a blender. Pour into 2 glasses and serve, garnished with fruit and mint sprigs if desired. 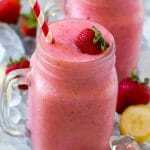 Strawberry banana smoothie is perfect for breakfast or snack. Thanks for your this delicious item. OMG! Looks so refreshing and yummy! I like the use of frozen strawberries. Strawberry Banana smoothie looks really good. Have never tried bananas with strawberry. Very excited to try this flavour. The smoothness of bananas with the flavour of strawberries sounds irresistible. My granddaughters love strawberry and banana smoothies when I take them out to eat at places that sell them. Being able to make them one at home would be a nice treat for all of us, during these hot summer months. Strawberry banana smoothies are my favorite! I love making them for breakfast. It’s quick, easy, and fills me up. Yours look delicious! Wow, I have never used any frozen strawberries. I should freeze some for shake’s purposes. Strawberry and bananas are good combo. A strawberry banana smoothie sounds so delicious. I love the combination of berries with banana! We love smoothies for breakfast, lunch, or even snack on a hot day. Strawberry banana is our favorite combo. That looks so good right now. 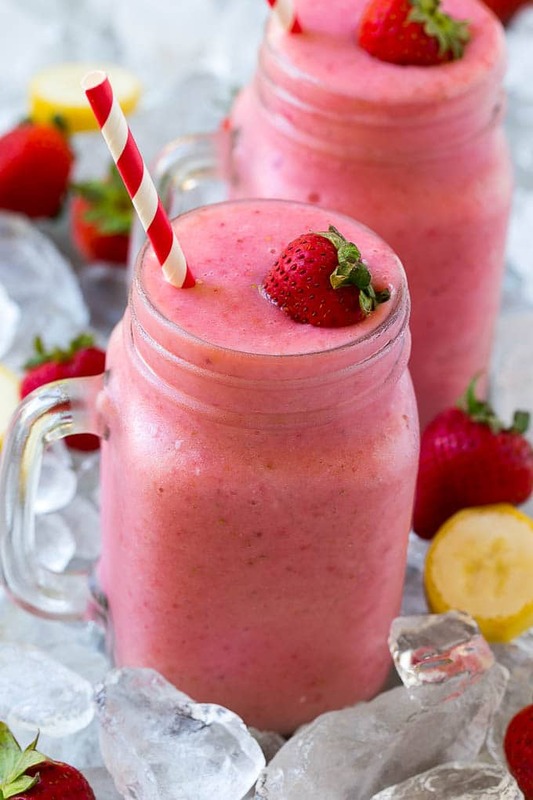 I love strawberry smoothies, they are my favorite. My Mom’s favorite fruit is banana so she’d love it too. I love smoothies anyway you can give them to me. They are probably one of my favorite ways to eat fruits. We eat these probably about once a week. I’ve never put apple juice in it that sounds like such a good idea. This looks so good! Surprisingly I haven’t made smoothies all summer! I’m such a bad mom. 😉 But I do have frozen strawberries in my freezer so I can!!! I drink a lot of smoothies and banana strawberry is by far my favorite flavor combo! I am going to go make one right now actually. If that smoothie tastes half as good as it looks it will be amazing. I love the health benefits when you are drinking something so fresh and cool. Those frozen strawberries look so refreshing and yummy. I would definitely like this for a morning pick me upper or afternoon snack! Now this is my kind of smoothie. Plus I always have everything on hand to whip this up in no time. We would drink this for breakfast, lunch at dinner and just as a snack treat . I love a sweet, refreshing smoothie to keep me cool on a hot summer day! Strawberry-banana is my favourite combo. My husbands Birthday is tomorrow and my son and I will be making this new drink for him because he loves Strawberries and it is something he can take with him to work. Strawberry and banana is such a fantastic flavor combination. 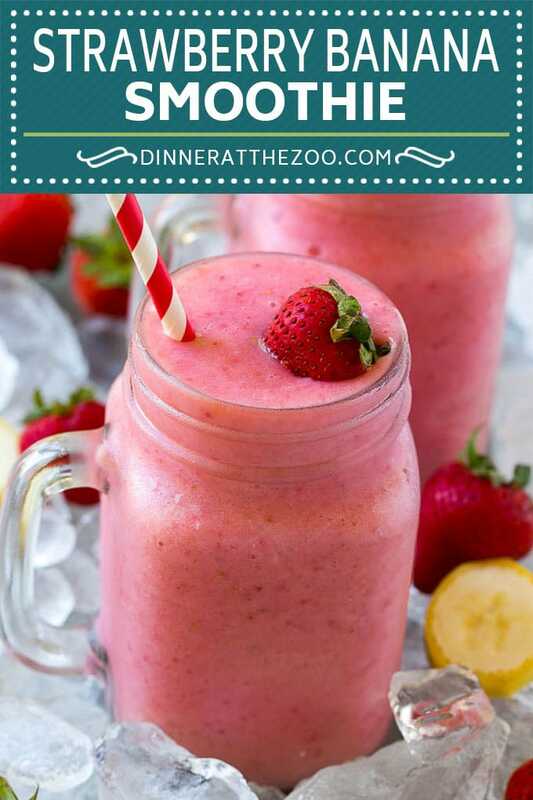 This smoothie is sure to hit the spot with the kids too. During the spring and summer, I have a fruit smoothie every morning for breakfast. I always keep some bananas frozen because I like to add one to my smoothie. I’ll have to try your version this morning. I have all the ingredients on hand. It looks delicious.